Burnt Hill Park is located at 148 East Street in Hebron. From RT 85 (Gilead Street, Hebron) turn onto East Street follow to 148 East Street. Field 1 is a Multipurpose Full-size Field which will be used as a Full-Sized Field and two Small Fields for Grades 1 -4 Boys and Girls activities and Learn to Play Programs. Field 1 if listed as Field 1a will be the short Field closest to entrance. 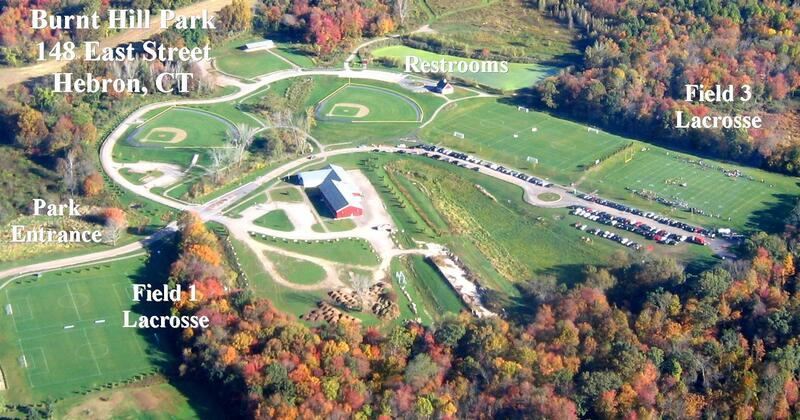 Field 1b will be the Field furthest from the entrance on right. Field 2 is a Full-size Lacrosse/Soccer Field which will be used as a Full-Sized Field (and possibly as two Small Fields for Grades 1 -4 Boys and Girls activities and Learn to Play Programs). Field 2 if listed for short field activities will be listed as Field 2a will be the short Field closest to the Restfoom side of the field on left. Field 2b will be the Field furthest from the Restroom on right next to Football Field.